PROJECT SUMMARY: A stunning house needs stunning outdoor lighting. This client wanted to showcase the homes architecture and front entrance, along with giving the property a “lived in” feel providing safety and security around the sides and backyard. Professional outdoor lighting was desired to help enhance this properties appearance and make the backyard patio function after hours when the sun goes down. This home currently has a vacant lot beside it, causing it to be darker at night on the side, leaving it vulnerable. Adding outdoor lighting and giving our client remote access through a smartphone or tablet made all the difference for their security lighting. LANDSCAPE LIGHTING FOCUS: This home had some really unique characteristics on the front elevation. There was a wooden pergola, stone work, and brick that all came into contact with each other. Each canvas accepts light differently. So as Southern Lights lighting designer, Pete Bryant laid out his plan, proper fixture placement, color, and wattage were chosen carefully. The home also has a more elaborate front entrance than most, drawing attention to the front walkway. With a lack of large trees to down light the space near walkway, Southern Lights chose to illuminate the brick paver walkway with solid brass path lights. These fixtures softly added pools of light along the elevation changes of the steps and through a nice glow into the planted natural areas. As for the backyard, the outdoor living space around the patio was extremely important. This is not only where entertainment occurs, but also where enough light was necessary to feel like you can grill out and still be able to tell if the meat is rare or well done. We gave these clients a manual dimmer – on/off switch right beside grill to allow for correct light output for the occasion. Also important to the homeowners, was to ensure that the security lighting was consistent with the landscape lighting around the home and adequately illuminated the architecture. Providing enough, but not too much light was critical. Built to last and to add. Creating a lighting design, that is scaleable is important. This property is ready for additional lights that may be desired in the future without having to re-wire and re-do any of the landscape lighting. Southern Lights has the opportunity to work with a lot of amazing clients and this couple was no different. Their love for their home shined through in their appreciation for the beautifully illuminated landscape lighting on this property. Elevation changes around the front entrance posed some challenges relating to safety, so a proper fixture was needed to provide enough light in the area without blinding guests or flooding the area with light, killing the overall lighting design and effect. 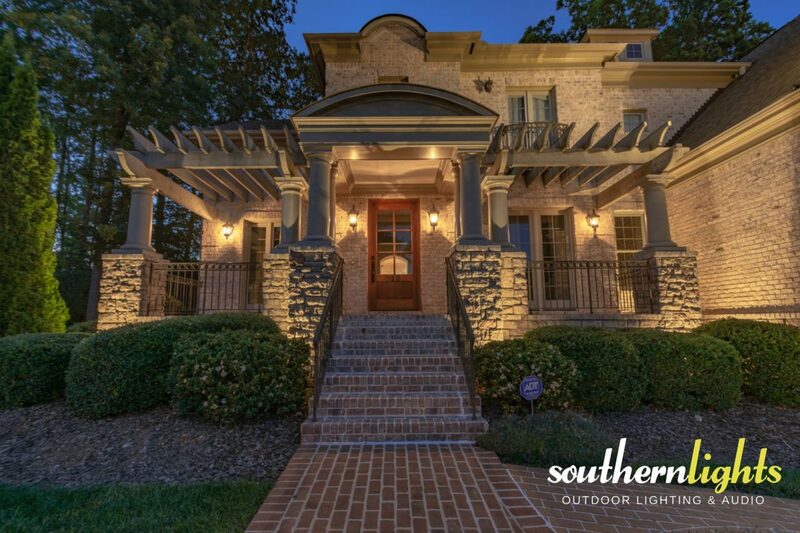 Southern Lights was able to locate and install the perfect solution and fixture for the area (Path Lights).